This is a recipe from Delish that DYP cooking instructor Wendy found for the holidays and made a few adjustments. 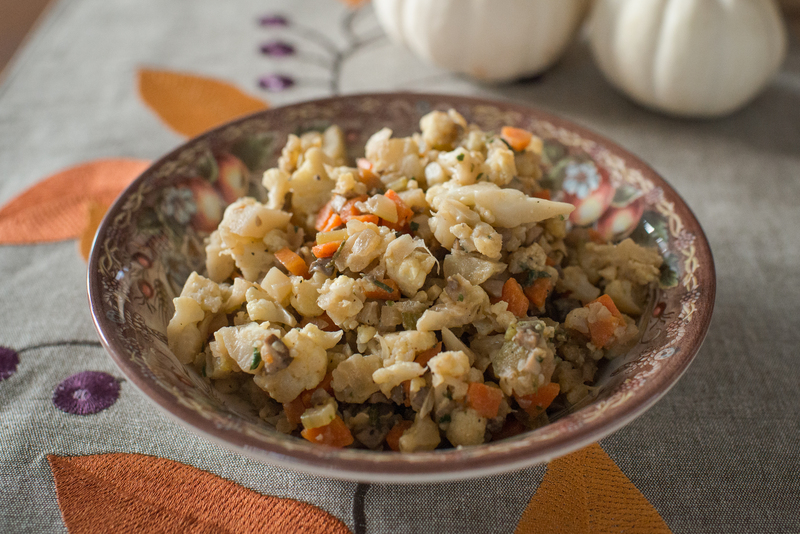 It's a perfect substitute for traditional stuffing for those who are gluten sensitive or trying to minimize carbs. When she made it at the Doctor Yum Project Kitchen recently it made the whole kitchen smell like Thanksgiving! It also got rave reviews from our tasters. Feel free to adapt it with other flavors you like. Dried cranberries or raisins added at the end would give some additional sweetness and bursts of flavor. Heat oil over medium heat. Add onion, garlic, carrot and celery and and cook until softened, about 7 minutes. Add cauliflower and mushrooms, then salt and pepper. Cook 8 to 10 minutes more until all veggies are softened. Add parsley, rosemary and sage and toss. Pour veggie broth in and cover. Keep lid on with heat on low for about 10 minutes until liquid is absorbed. Season with additional salt and pepper to taste. Because these veggies are so soft they are easy to puree with some additional veggie broth to the desired consistency. For more advanced eaters, dice up veggies really small so babies can eat safely without pureeing and can practice picking up with little fingers. To avoid additional salt for babies, add salt to the recipe at the very end, after a portion is removed for the baby. This is a great way to introduce the flavor of savory herbs to new eaters.